Skip to the navigation. Skip to the top of Page. Skip to the content. Archie, who came from Milwaukee, got embarrased at the 95TH anniversary when his bud's ribbed him for not being up on two wheels. He was determined that for the 100th he would remedy that. And what a remedy!! 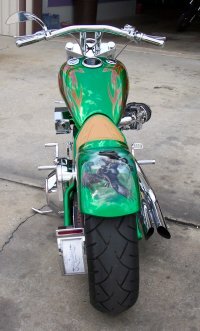 His dream was a rubbermount, Harley-Motored, custom.... and we think his dream was fulfilled. He walked into our shop in early 2000, and we laid out a plan. 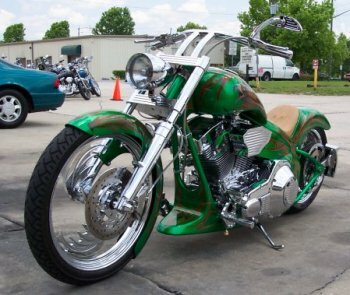 Archie is a pay-as-you-go kinda guy so we decided on a Gambler softail frame for a Twin-Cam Bagger powerplant, and every month he would come in and drop off some cash and order parts as he went. Some three years later, things started happening fast. Extreme Machine was nice enuf to come up with the killer wheels with eagle heads on them, just in time for Archies' Project dubbed "Twin Eagle". He built the motor himself after a beautiful polish job. The front end is a Pro-One, with custom Speed Ball design done in our mill. The Front brake is a Performance Machine 4 Piston Caliper, while the back is handled by a GMA Pulley Brake. "Arlen & Jesse" is what we started calling Archie and his sidekick Jim as they welded on and ground off more metal than most bikes ever had! 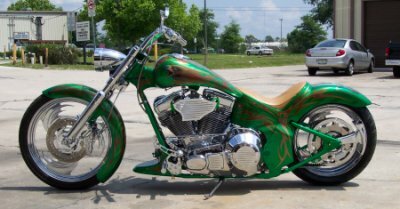 There is so much custom sheetmetal on this bike, it is difficult to list.The air dam is molded into the lower legs, the tank is molded into the frame, the seat and the rear fender are as one... The bike flows!!! Dual Edelbrock carbs stick out the right side, with a custom coil cover on the left . A Yaffe Tailight keeps the plate in place, mounted to a custom bracket. Our friends at Custom Works, Bent up a great set of one-off pipes based on Archies' own design. SpaceCoast Plating made all the things shine, while we took care of the electrics. 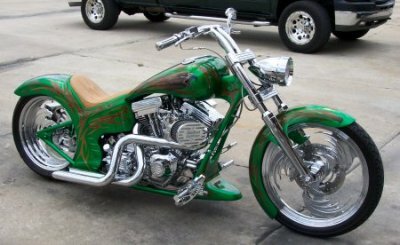 This bike sounds AWESOME and took a Second place trophy at The EasyRiders Show in Savannah, and 'Best of Show' at the Leesburg Rat's Hole show. Twin Eagle is headed to Milwaukee this August...Right on Schedule!! Bet the Boys won't be pickin on Archie now!